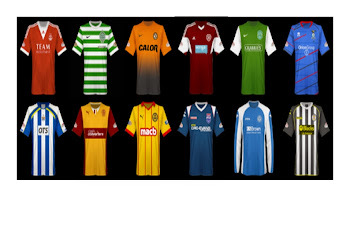 Compared to the last few seasons, the Scottish Championship isn't getting much love right now. That's probably - okay, definitely - because Rangers, Hearts and Hibs provided rather more glamour (or, rather, bigger potential TV audiences) than the clubs currently occupying Scotland's second tier. That's a shame, because this season it's been enthralling...in a nostalgic, direct football, Ron Manager jumpers for goalposts beans on toast for tea sort of way..
That's mainly because on any given day any team can beat anyone else. Unless you're Brechin City, that is. Promoted via the League One playoffs despite finishing closer to bottom than second place and with a negative goal difference, Brechin were earmarked at the start of the season as the whipping boys. Still winless after 20 matches and already 13 points from safety, even Theon Greyjoy glanced up at the league table from his torture rack in Game Of Thrones Season 3 and thought "this must be hell for them." Aside from Brechin, Dumbarton are the only other part-time club in the Championship and probably the only other club not to have any realistic designs on trying to get promoted. But the Sons have survived in this division for five and a half years - an extraordinary achievement given that they basically have to bring in a completely new squad every summer - by taking advantage of those who think they are Brechinesque cannon fodder. After Caley Thistle lost there in September one sympathetic Dundee United fan told me "you don't realize you're in the Championship until you've been bodied by Dumbarton". Basically their role seems to be to induce a bit of humility in the Wannabes and Hasbeens that they play most weeks, like a Liberal Democrat MP before the 2010 coalition. The other eight have much loftier ambitions. Three have been in the Premiership within the last three seasons. Another three have been in the promotion playoffs in one of the last three seasons. The other two have been in the top flight themselves in the not-too-distant past. So they all think that, if they sign some decent players, have a decent manager and bring through a few decent youngsters, then it might be their year. The flip-side is that it's very easy for it to all go very wrong very quickly. Just take Falkirk: 2015 Scottish Cup finalists; within 90 minutes at Rugby Park of promotion in 2016; second in the table and another playoff spot last May. Currently they are ninth, well clear of Brechin but three points behind Dumbarton. Survival is now their aim. Whilst you'd fancy them to outdo Dumbarton over the remainder of the campaign (especially now they've signed almost an entirely new team since bringing in Paul Hartley as boss) would you really put your mortgage on it? St. Mirren were in the Bairns' shoes only this time last year, winning only two games before mid-February and seemingly headed for a second relegation in three years. Having showed no signs at all of turning things around after being hired in October, Jack Ross then did indeed turn things around and dragged them to safety. Now they're top of the table thanks to some very sensible acquisitions of players proven at this level and a string of talented academy players. Whether they would thrive in the Premiership, particularly once Lewis Morgan falls permanently into Celtic's clutches, is a matter for debate - the likes of Craig Samson, Gavin Reilly and Cammy Smith are in the Championship because they weren't good enough for the higher level - but understandably St. Mirren would really rather get promoted first and worry about that later. And it's not as if having a squad filled with guys who have recent Premiership experience is an enormous boon, as Dundee United and Inverness are discovering. Both face uncertain futures if they remain here beyond May 2018; Caley Thistle already need investment from directors to cover the shortfalls from relegation and further costcutting will follow if they don't go back up at the first attempt. The only possibility of that is via the playoffs, a prospect that at least looks a lot more realistic than it did three months ago as John Robertson has finally put together a side capable of getting results. Mind you, ICT are still only seventh just now, albeit within touching distance of that crucial fourth spot. And they've already achieved the biggest miracle of the season - to the disbelief of United fans - by transforming Coll Donaldson into a competent 'baller. United are second, but given the investment in several players who could probably do a job for a top flight club it feels like anything other than top spot would be a disappointment. And yet despite punting manager Ray McKinnon in October they haven't looked any more dominant than they did last season. The arrival of a competent coach, Csaba Laszlo, should have been enough to drag them across the line but St. Mirren have proven resilient and won the clash between the sides at the end of December. United's recent catastrophe at Falkirk Stadium, losing 6-1, may turn out to be a blip but with talented midfielders Scott Fraser and Fraser Fyvie potentially out for the season the Arabs have cause for concern that, like a year ago, they may limp into a playoff and come up short again. It's no secret that United's financial situation is not great - the money from Andy Robertson's sell-on clause made a big difference to their budget for 2017/18 - and a third straight season in this division would be a disaster. Dunfermline are currently third in the table, though only five points separate them from Caley Thistle. Nearly five years since their administration, the Pars have got their house in order under Allan Johnston who got them promoted back to the Championship two summers ago. Their form in the second half of last season and the first quarter of this was that of promotion challengers, but the flip side of having attacking talents such as Joe Cardle, Kallum Higginbotham, Nicky Clark and Declan McManus is that there isn't much spare cash for squad depth. Only in the last few weeks have they managed to start stringing wins together again. Like Dunfermline, Queen of the South also have a relatively threadbare squad, going for quality rather than quantity - and how! 36 year old Stephen Dobbie is doing his best impression of a Dumfries And Galloway Teddy Sheringham and is arguably the best player in this league, already notching 20 goals to go with the 26 he managed last season. Queens' season depends heavily on keeping him fit, and on trying to augment the least experienced squad in the Championship with good loan players. St. Johnstone pair Jason Kerr and Chris Kane have impressed...but both will return to Perth next week leaving gaping holes that Gary Naysmith has to fill if they are to remain in the top four. And if they slip, Livingston are next in the wings; whilst they were never likely to be relegation candidates, Livi are doing remarkably well for a newly promoted side which is testament to the good job that David Hopkin (who I still have a soft spot for because he was an absolute demon of an AM RC in Championship Manager 96/97) is doing in charge. Losing striker Danny Mullen to St. Mirren wasn't ideal, mind, but Hopkin has altered the dynamic from last year's gung-ho attacking play to a well-organized setup led by veteran keeper Neil Alexander and an excellent set of central defenders in young Craig Halkett and (whatever you think of his previous off-field issues) Declan Gallagher. Whether they have the attacking talent and experience to see them through to May is uncertain. And last but not least (sixth, if you look at the table) are Morton, who are probably overachieving given they also have a pretty thin squad that depends on the ageing Gary Harkins for creativity. However, since Chic Young thinks Jim Duffy should be the new Scotland manager (no, really!) maybe a comfortable mid-table spot is the least we should expect, especially since they made the playoffs last year. In Jai Quitongo they have one of the most exciting young talents around, though he hasn't really kicked on this year. If he's half as fun a player as his dad was then he'll do okay, though. Morton are just one of many sides in this battle who could with a little luck make it into the postseason fixtures and yet would be crippled by a lengthy casualty list. It may be injuries which prove the deciding factor for who finishes in the top four..and even, were St. Mirren to lose any out of Morgan, Cammy Smith and Gavin Reilly, top spot. But my take-home point is that this league is a highly entertaining and competitive one with pretty much everything but tenth place still very much in the balance. Sadly Sportscene don't care any more since Rangers aren't there...and the BBC didn't even bother doing a live commentary game last week during the Premiership's winter break. But it's a much more level playing field and it has more quality than you think. How things will pan out by mid-May is just about anyone's guess. Viva Le Championship! I put a complaint into the BBC about the lack of a Sportsound on 2 January. Unusually for them, the BBC pretty much admitted that they got it wrong and could rectify that if the situation recurs. "We cover many games over the course of a season and have covered full cards in the Championship and lower league matches during the winter break and on international weekends. We covered St Mirren v Dundee Utd on Friday 29 December and the full card of fixtures on 6 and 13 January. We don’t normally cover midweek matches in the Championship but we do accept that, although there were scheduling issues, we could have had a programme on the 2nd January and we will look at this in future years. Morton v St Mirren was live on BBC ALBA and was there was a live stream on our website."